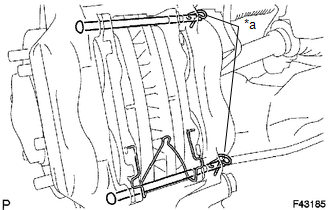 (a) Align the matchmarks of the front disc and the front axle hub and install the front disc. When replacing the disc with a new one, select the installation position where the disc has the minimum runout. (a) Temporarily install the front disc with the hub nuts. (b) Using a dial indicator, measure the disc runout 10 mm (0.394 in.) away from the outer edge of the front disc. If the disc runout is the maximum value or greater, check the bearing play in the axial direction and check the axle hub runout (See page ). If the bearing play and axle hub runout are normal, adjust the disc runout or grind it on an on-car brake lathe. 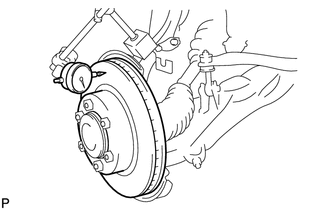 (a) Install the disc brake cylinder assembly with the 2 bolts. (b) Using a union nut wrench 10 mm, install the brake tube to the disc brake cylinder assembly. Use the formula to calculate special torque values for situations where a union nut wrench is combined with a torque wrench (See page ). (a) Install the 2 front anti squeal shims onto each of the front disc brake pads. If necessary, replace the anti-squeal shim kit when replacing the brake pad. 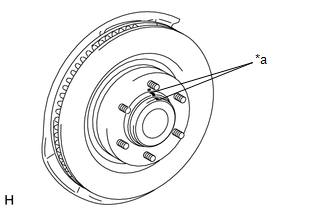 (a) Install the 2 front disc brake pads with front anti-squeal shim onto the disc brake cylinder assembly. There should be no oil or grease on the friction surfaces of the brake pads and the front disc. (1) Install the anti-rattle spring to the front disc brake pad. The anti-rattle spring can be used again if it has sufficient rebound; no deformation, cracks or wear; and has had all rust, dirt and foreign matter cleaned off. (2) Install the 2 front disc brake anti-rattle with hole pins to the disc brake cylinder assembly. (3) Install the pin hold clip to the 2 front disc brake anti-rattle with hole pins. The pin hold clip can be used again if it has sufficient rebound; no deformation or wear; and has had all rust, dirt and foreign matter cleaned off. (3) Install 2 new pin hold clips to the 2 front disc brake anti-rattle with hole pins. Be sure to install the pin hold clip with the handle facing to the vehicle center.